My husband LOVES Elvis so this year I decided to make our son Carson (18 months) an Elvis costume. Without a pattern,I had no idea where to start, so I googled Elvis' white eagle jumpsuit and tried to find as many pictures of all the angles I could. I used white and red silky fabric, about 1000 rhinestones, an eagle belt buckle off ebay and some gold chain. I've never sewn any kind of clothing before and without a pattern it took a lot of sweat and tears. I printed a picture off the internet of a close up of the eagle design and laid it under the fabric sort of like tracing to set the rhinestones in the correct place. I used gold puff paint to fill in the pattern also. It took me a few hours a night for a month to finish it just in time for Halloween. Carson hated when I put it on him, but once he started getting all the attention from it he loved it! I apologize for the lack of pics, it's hard to get a toddler to stand still. But as you can see, he thought he was hot stuff with all that attention. Love this! I'm trying to recreate. Can you share your email? I would also like tips on how to make this costume. Is this for sale? 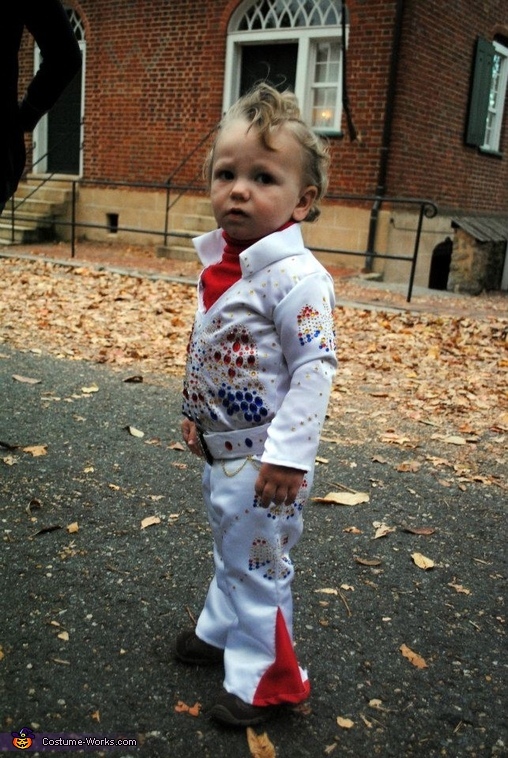 I am having a hard time finding an elvis custome in his size...he wears 18 months.